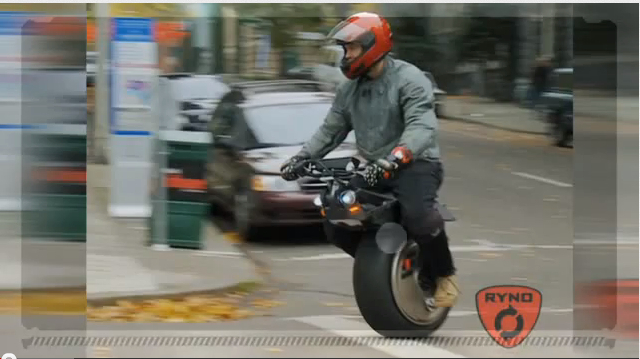 Ryno Motors’ powered unicycle. Photo via Ryno Motors. America’s great foray into “personal, green transportation”—the Segway—has not actually transformed the ways pedestrians interact with the built environment, so much as it has provided tour groups and campus police forces with a new way to cruise. These vehicles, which blur the distinction between motorized vehicles and urban scooters, have their newest competition: the one-wheeled motorcycle. Ryno Motors, a Portland, Ore. company, has crafted a working prototype of the motorized unicycle, whose sci-fi-like design takes its cue from a video game, uses internal balancing technology to hum around while staying amazingly upright around downtown Portland. This prototype, which is described as “falling between the cracks” of what it is to be pedestrian, which can “go onto a sidewalk” or “into a lobby,” indeed pushes many boundaries. Safety may even be among them. To put this vehicle in context, motorcycle crashes have accounted for tens of thousands of fatal accidents over the course of the past decade in the U.S. alone. Brazil, where motorized bike culture is prevalent, had 2,863 crashes involving motorcycles in Rio alone.